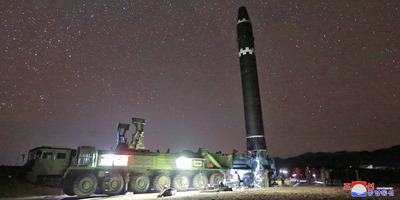 KCNANorth Korea has already suggested something much more dangerous than testing an intercontinental ballistic missile. North Korea tested a capable intercontinental ballistic missile on Tuesday, but the country has already hinted at a more dangerous test that would have far-reaching effects. North Korea has previously threatened to detonate a nuclear device above the Pacific. Though the test would be destructive and provocative, North Korea has several reasons to attempt it. North Korea launched its most capable missile on Tuesday, displaying a range that could most likely reach the US mainland – but the country has already hinted at a more dangerous test. 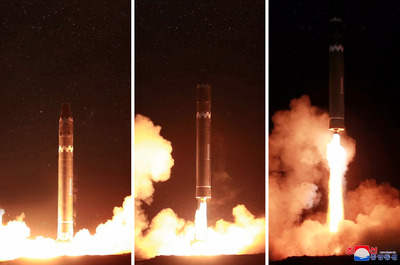 In its state media, North Korea routinely swears to conduct missile tests and complete a missile program that can strike the US with nuclear weapons. But after US President Donald Trump threatened to “totally destroy” North Korea in a speech to the UN this summer, Pyongyang laid out another goal. In October, CNN’s Will Ripley quoted a senior North Korean official as saying the US should take the threat “literally,” hinting it might follow the completion of an intercontinental ballistic missile – something North Korea declared on Wednesday. North Korea’s latest ICBM test drew condemnation from world leaders – the US’s ambassador to the UN, Nikki Haley, said it took the US and North Korea “closer to war” – but did virtually zero damage. The missile launched, crested at 2,800 miles above earth, and splashed down into the Sea of Japan. If North Korea were to carry out its threat of detonating a nuclear device over the Pacific, it would affect millions of lives. North Korea essentially nuking the ocean would have far-reaching effects and draw international condemnation. With the amount of traffic at sea and number of people who rely on the ocean for food and their livelihoods, the test would most likely kill people directly or indirectly. And atmospheric detonations of nuclear weapons carry the risk of electromagnetic pulses, which could shut down electrical grids and cripple infrastructure. 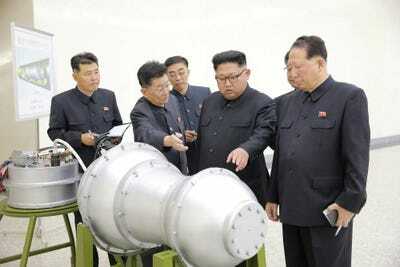 KCNA via REUTERSNorth Korean leader Kim Jong Un, center. North Korea’s underground testing site recently withstood a nuclear blast that experts have said was at least 10 times as powerful as the bomb the US dropped on Hiroshima – but reports of cave-ins, landslides, and mini-earthquakes have followed as the ground under the mountain has resettled. Though intelligence sources suggest North Korea can still access its underground testing site, another test, especially a more powerful one, could blow the lid off entirely, making it more likely that the country would conduct it over the Pacific. While the US acknowledges North Korea’s possession of ICBMs and nuclear weapons, North Korea has never demonstrated its ability to combine the two. It’s one thing to launch a rocket very high and imply it could travel very far. It’s another to attach a nuclear device and ensure it survives the incredible heat and pressure of reentering the Earth’s atmosphere at many times the speed of sound and detonates at a set time. For North Korea, a test over the Pacific would demonstrate that it has mastered some of the more intricate work needed for a credible nuclear force. If an ICBM test brings the US to the brink of war with North Korea, a nuclear detonation above the Pacific might tip the scale.